Bring Skewered Surf and Turf with Veggies to your next party or barbecue, and get ready for some excitement. 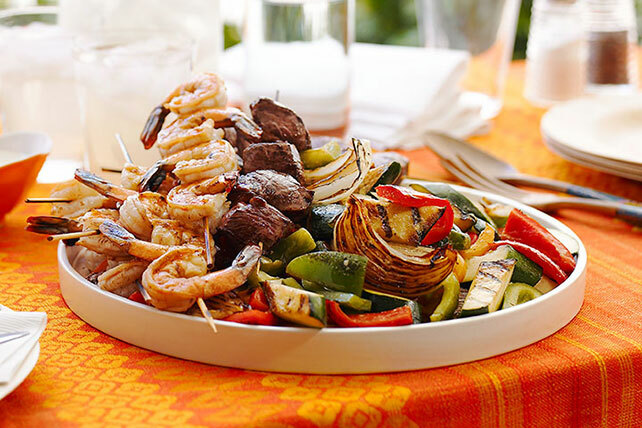 Skewered Surf and Turf with Veggies is a great Healthy Living summertime option that they're sure to appreciate. Blend first 5 ingredients in blender until smooth. Reserve half the dressing mixture to serve with the grilled shrimp and meat. Grill vegetables 10 min. or until crisp-tender, turning and brushing occasionally with some of the remaining dressing mixture. Meanwhile, thread steak onto 5 skewers and thread shrimp onto 5 separate skewers. Add to grill along with vegetables. Grill 5 to 7 min. or until shrimp turn pink and steak is done, turning and brushing occasionally with remaining dressing mixture. Remove vegetables from grill; cut off stems and remove seeds from peppers. Chop all vegetables into 1-inch pieces. Place on serving platter. Top with shrimp and steak skewers. Drizzle with reserved dressing mixture.